The inspiration for my plans often come from my wife, or from friends who mention a project that they are going to build. Always thirsting for an idea for a wood plan to share, I immediately jump at them “Do you have a plan?”. When they don’t, I kick into gear and look for a woodworking plan that is perfect for their upcoming project. A friend decided to build a number of raised garden beds on his property. 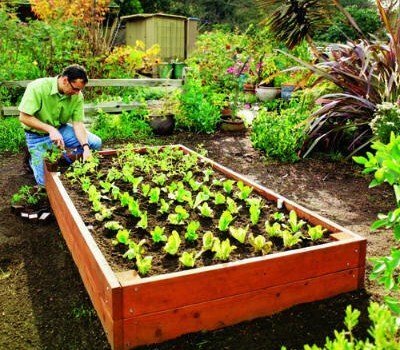 He has plenty of land and wants to accomplish a couple of things with his raised garden beds. He would like to eat healthy without the added chemicals and genetic engineering that is found in today’s crops, and he wants to save a few dollars while doing so. 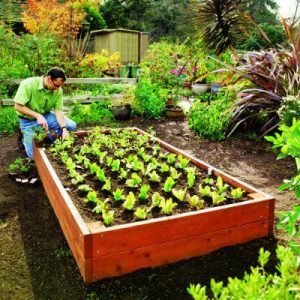 In addition to that, he can teach his children some responsibility by including them in the care of the garden beds. The more I type, the more I think I should have one of these planting beds for myself. The following planting bed plans come from Sunset Magazine. It is very simple and uses little hardware. You can purchase hardware kits for the corner joints, but they are surprisingly expensive and rather unnecessary. The person who will be building these also has a bit of a slope, so he needed something that he could anchor and the extended 4×4 at each corner should handle that job. Cedar is an ideal (although expensive) wood for this project. Some will use pressure treated and claim it is just fine, but I would not want the harsh chemicals used to treat the lumber seeping into my daily salad. Spend the extra money for Cedar or Redwood. Click on the picture for the full set of raised planting bed plans. If the link is dead, let us know since we retained a local version to share. 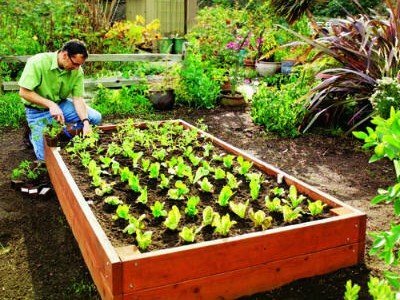 How to build a raised bed for your garden – Sunset.com.